This Newsletter can be downloaded as a PDF for printing – please click here. Another busy day up on the hill above Llandegley. The main item of news is the launch of the Friend of the Pales initiative; details in full below. 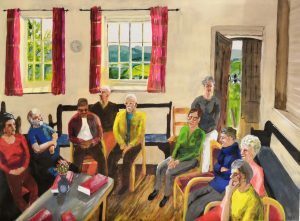 We have also hosted the Friends in Wales gathering and have a report by Bridget Cherry, we have introduced many Ffriends to Sufism and have a report by Pamela Thompson on that event and we have held an Open Day to share progress at the Pales with AM Friends. Launch of Friends of the Pales. The Sawell Family Fund provides financial assistance to meetings during the development phase of a project. The purpose of the grants is to develop and enhance meeting houses. These improvements should serve meetings’ worship. They should also inspire the local community to value and enjoy Quaker premises. The Fund makes small grants of up to £5,000 to meetings during the development phase of any work. It can help pay for advice and feasibility work. We have applied for and been granted £3,500 to cover the costs of the next stage in the planning process, covering the cost of Planning and Architects fees. We are very grateful to them for their support. 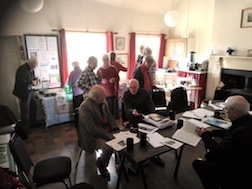 Friends in Wales provides a meeting point for all Quakers in Wales, separate from the three Area meetings of North, Mid and South Wales. 42 people from all over Wales (with a few from England) filled the two rooms of the Pales Meeting House for some very interesting discussion. Peter Hussey and Catherine James acted as clerks, and good communication was ensured through the efficient use of headphones for those unfamiliar with the Welsh language . The opening readings from Quaker Faith and Practice, on the Peace Testimony and on the Inner Light which guides us, were very relevant for the afternoon talk. But before this took place there was the usual business of appointments to various roles, in particular, Nominations. An interesting debate, perhaps with a broader lesson, occurred over whether it was advisable to appoint a young, enthusiastic but inexperienced person to a role requiring some background knowledge of people and practice. The solution which emerged was to accept the recommendation but to accompany it with a second appointment of someone older, who could offer advice if needed. It was agreed that Nominations roles were often lonely places, and that more face-to-face meetings could be beneficial. There was a report from the Wales Focus group on the recent questionnaire about the future role of MFW and its plan to develop of a programme of speakers, workshop and events. There was also discussion of the need to translate the ‘Peace Week’ pack for schools into Welsh, so that it is available more widely. The c. £3000 cost for this will be sought through Friends’ organisations and individual supporters. A very interesting paper by Peter Hussey was circulated, which draws attention to the cultural differences between England and Wales. This should be required reading for anyone in Southern Marches unfamiliar with the special character of the country in which several of our meetings are located. Historically Wales became a second class and much exploited partner in the ‘United‘ Kingdom, but one which has preserved its own political outlook, with a strong sense of community and environmental values ,as well as a continuing awareness of its distinctive religious history and mythology. Peter Hussey spoke about current plans for the Pales, emphasising how its location near good roads made it easily accessible from all parts of Wales. He explained how there was scope for the building to develop as a spiritual resource to serve not only the local community and Southern Marches Area Meeting, but the whole of Wales and Britain Yearly Meeting. He described both the vibrant talks and events that have taken place recently, and the planned improvement of facilities that would enable greater use. This day course, held at the Pales, was run by Karim Hadden, who is experienced at running sessions to teach Dances of Universal Peace. We sat in a circle as Karim explained the basic principles of his Order of Sufism which was passed down by Hazrat Inayat Khan. He told us that the Sufi thinks that we all follow one religion, only in different names and different forms; but behind the names and forms there is one and the same spirit and there is one and the same truth. We also had some simple guided meditations. The first of these was a walking meditation when we were encouraged to think about our breathing, and feel the energy moving through our bodies. The other one was on the winged heart which is the symbol of Sufism. Sufism is experiential rather than based on intellectual premises. Sufis seek to read themselves through direct personal experiences. The experiential parts of the workshop were when Karim taught us several lovely Sufi songs, which all had simple movements to go with them, so we danced in a circle and sang, as Karim played his guitar. There were several lovely dances, especially the final one in which we each blessed other people in the ring by placing our hands on their heads, and received blessings ourselves. The day was rounded off by the tea breaks when we sat and enjoyed the glorious autumn sunshine and the gorgeous view over the hills. We had a very varied and nourishing shared lunch. when it holds the divine spirit it soars heavenward; the wings picture its rising. The crescent moon symbolises responsiveness, the crescent grows fuller in the light of the sun. The star represents the divine spark, reflected in the human heart as love, which helps the crescent toward its fullness. On 31st October we opened the Pales Management Group to everyone, to share the way we work as a team and to explain where we are with the renewal process. 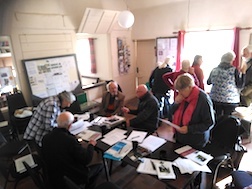 There were displays of the proposed alterations to the cottage and grounds together with lists of past events and publicity material. The morning was very informal, with discussion and explanations and was followed by a shared lunch. We then held a more formal meeting, with an agenda, and welcomed input from our visitors on the matters under discussion. We were delighted to welcome Stevie Krayer, AM Clerk to our meeting and that two of the visitors agreed to join the PMG and we will welcome them at our next meeting. The main item on the agenda was the launch of the Friends of the Pales initiative (thepales.org.uk/fotp) and our visitors were able to contribute their thoughts on the best way forward with it. Mona Swanson passed away peacefully on Monday 27th of August at the age of 96. She was a keen historian and had published several texts. 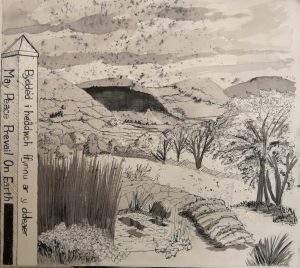 The Pales was her favourite place where not only did she love its beautiful views and surroundings but she found home with her ancestral links spanning back centuries. The Lloyds in the burial grounds are her ancestors, the Price’s were the cousins and a few others. An ancestor called Jane taught at the school and Thomas Lloyd walked miles from home to be taught at the school. Here are two photos from her last visit to the Pales in 2016. Mona didn’t want to be defined by anything but she wanted to embrace her Quaker roots in the form of peace and simplicity. The illustrations for this Newsletter have been provided by Peter Hussey, a member of the Pales Management Group and also the artist who has produced the wall panels in the school room. 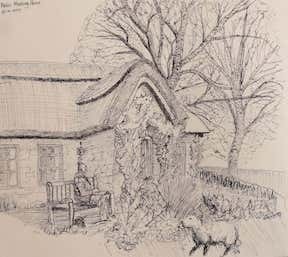 Peter has attended most of the Art events at the Pales and has shared the results of those visits. We are arranging events for next year and have already booked some, others are awaiting confirmation of dates etc.